At Safe Seal LLC we use a top of the line machine for filling our cracks. We mainly use a hot-pour crack filler, but cold-pour in certain scenarious that don't allow us to use the hot-pour. The crack filling machine we use works by filling the machine with contractor grade rubberized crack filler. After the machine is loaded with material it is then melted down to a liquid consistency using a propane tank and a torch. 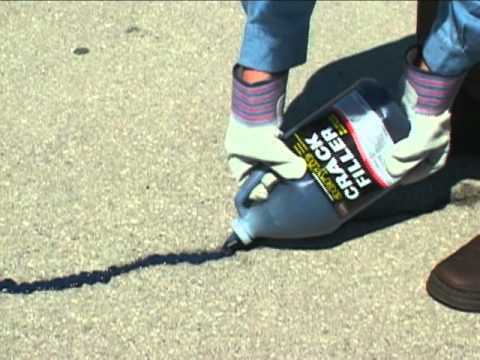 After the material has been liquidized it is then poured over the cracks filling it from the root of the driveway. Once the intergrety of the driveway has been repaired, we then put black silica sand over the crack to reduce "tracking" and "lifting" of the crack filler. "Hot-pour sealants can be used to fill deeper, larger cracks than is possible with cold-pour sealants. Cold-pour sealants shrink, which disrupts the bond — and the larger the crack, the greater the potential for a quick failure. Cold-pour products cure by evaporating the moisture in them, so they will not work in lower temperatures when the evaporation rate is insufficient to allow proper curing. On the other hand, hot-pour products can be used when the ground or air temperatures plummet. 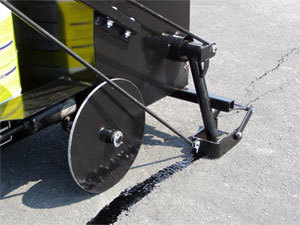 Like the surrounding asphalt, hot-pour sealants are flexible after drying. This gives them the ability to expand in hot weather and contract in cold weather without breaking the bond with the surrounding asphalt. The cold-pour products are rigid after curing, and since they lack the ability to expand or contract, the bonds are easily broken. The fill can then be easily purged from the crack, which can sometimes happen the first time the ground freezes. If the repair is forced out, the crack is left unprotected, allowing water to reach the foundation and undermine the integrity of the asphalt, resulting in further damage. Sealcoating jobs are effective with cold-pour and hot-pour. Because cold-pour applications need less time and equipment, the cost for repairing a crack of similar size is normally less than the cost for hot-pour. However, cracks repaired with cold-pour have a very brief life, so the repair may need to be made repeatedly. Costs therefore tend to even out with time. Cold-pour is typically used only for residential surfaces although it can sometimes be used for other purposes. However, the majority of government-funded road and street projects as well as commercial and industrial properties require the use of hot-pour crack sealants." What is the difference between hot-pour and cold- pour crack sealants?